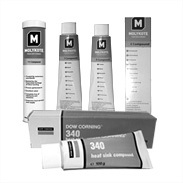 Silicone compounds are grease-likelubricants containing silicone fluids and inert silica fillers. They are resistant to oxidation and thermal degradation while maintaining their properties over a wide temperature range. They are designed as release agents and may be used as O-ring assembly lubricants, non-conductors of electricity, non-curing sealants and as assembly lubricants for plastic and rubber parts. Silicone compounds may be used for applications where they function in a dual role as both lubricant and sealant. For best results, before applying, the surface should be clean and dry. Injection pumps for grease can hide silicone compounds, test before use. Requiring more than a thin layer coating, the composition can mix with the solvent (white - spirit) and apply with a brush or spray. • Surfaces that in the end will be painted or polished. If you want to remove the silicone coating, wipe or rinse the surface with a solvent or wash detergent. • The O-rings or other items made of silicone rubber, because it may worsen the quality of silicone rubber. Also, these compounds may slightly increase the amount of natural butyl rubber. All rubber products should be checked for a slight increase or decrease in size. • These compounds are not intended for use in liquid oxygen or other aggressive oxidizing chemicals and should not be used where want the combination of liquid oxygen.